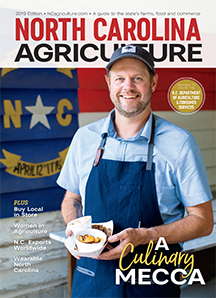 While traditional agritourism outlets – corn mazes and pumpkin patches – remain popular attractions, North Carolina farmers are finding innovative ways to generate new streams of income. Weddings, farm-to-table events and educational workshops are drawing visitors to farms across the state. Charlie Kissling, owner of Walnut Hollow Ranch in Hayesville, N.C., used his background in the restaurant industry to attract customers to his beef cattle farm. Kissling added a kitchen to his farm store and began hosting farm-to-table suppers featuring dishes made with beef from the farm. He also installed five RV connections on the property and converted a barn loft into a vacation rental apartment. He says he spent about five years in planning mode, investing in the infrastructure to make the farm experience as enjoyable as possible. Today, Kissling’s farm is a popular destination with daily farm tours, monthly suppers and pasture walks in the spring and fall. Kissling also offers cooking classes for his customers in the winter. In Randolph County, Ginnie Tate and her family’s Goat Lady Dairy invites visitors to a gourmet dinner featuring the farm’s artisan cheeses. Held monthly by reservation in the dairy barn’s dining room, the Dinner at the Dairy events help introduce visitors to farm life as well as give them a taste of locally grown products. The dairy also partners with a neighboring farm to host Open Farm Days, an event that invites families to explore the farms, ask the staff questions, tour gardens, pet animals and taste the dairy’s cheeses – all for free. The Lazy O Farm in Smithfield invites children to interact with animals, enjoy a hayride and experience life on a farm. Britt and Fleming Pflan, owners of Celebrity Dairy in Siler City, began using agritourism as a marketing tool for their goat farm more than 20 years ago. Pflan says the tours and dinners resulted in a dramatic increase in their customer base, and became so popular with visitors that Britt took early retirement from his career as an aeronautical engineer and built a bed-and-breakfast on the property. That nostalgia has led several brides to seek out farms as wedding and reception venues. Jackson Farm in Godwin offers brides simple elegance on a 10-acre wooded lot. The Guest House, a renovated farmhouse that dates back 100 years, is available for overnight rentals as well as special events. Chapel in the Woods in Louisburg and the Barn & Gardens of The Little Herb House in Raleigh both receive rave reviews for their scenic settings and for providing guests a quaint, rural experience. Celebrity Dairy also hosts weddings on the property, and Pflan says these agritourism experiences help bridge the gap between consumers and growers.